Summary: Oscar winner Nicolas Cage ("National Treasure," "Ghost Rider") and Ron Perlman ("Hellboy," "Hellboy II: The Golden Army," "Sons of Anarchy") star in this supernatural action adventure about a heroic Crusader and his closest friend who return home after decades of fierce fighting, only to find their world destroyed by the Plague. The church elders, convinced that a girl accused of being a witch is responsible for the devastation, command the two to transport the strange girl to a remote monastery where monks will perform an ancient ritual to rid the land of her curse. They embark on a harrowing, action-filled journey that will test their strength and courage as they discover the girl’s dark secret and find themselves battling a terrifyingly powerful force that will determine the fate of the world. EN 5 Second Review: It’s a lot like all Nick Cage movies, horrible yet somehow quite entertaining once you get past how awesomely bad it is. This is bad in a schlocky 80’s kind of way and yet somehow we were entertained. 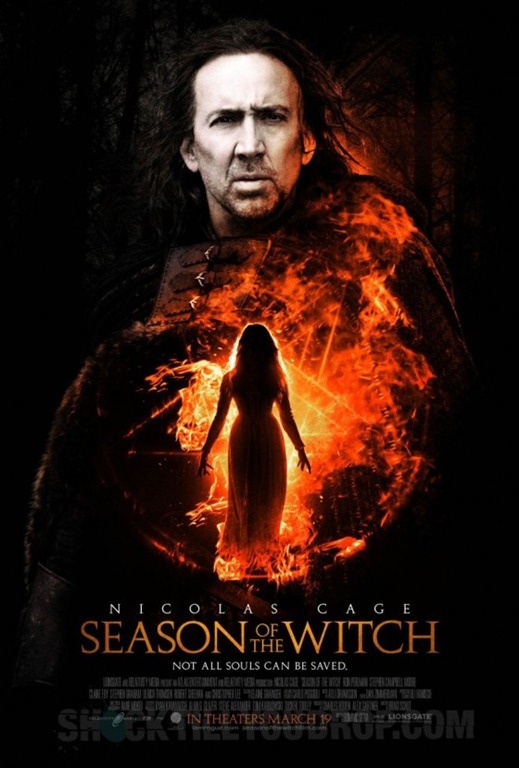 Slay the Most Men: Behmen (Nicolas Cage) and Felson (Ron Perlman) wage war.